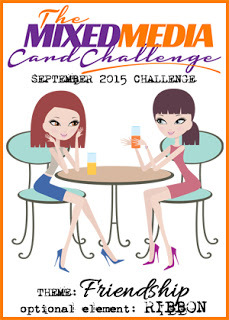 It's the first of September and time for the next Mixed Media Card Challenge! This month's theme is Friendship with the optional element of ribbon. I didn't use the optional element this time - just the friendship theme! We often share coffee with friends, at home, at work, in the car, on a plane......! So for my card I got out my ARTplorations Coffee Cup stencil. I used a really cool technique from Tim Holtz Compendium of Curiosities Vol III page 48 called Layering Stencil Monoprint. I took the stencil, turned it over on my craft mat and rubbed my Ranger Distress Vintage Photo ink pad all over the stencil. Then I lightly spritzed it with water. I flipped it over onto a 4" x 5 1/4" panel of Rustic Cream card stock and quickly pressed over the stencil to be sure the watery ink touched all the surfaces. I removed the stencil and dried the panel with my heat tool. So it's like a negative of the stencil! Then I sponged all over the panel with Ranger Distress Stormy Sky ink. I sprayed some water into the palm of my hand and flicked water onto the panel with my fingers. The Distress Inks react with water and you get these wonderful water drop marks. I dried my panel again with my heat tool. I stamped the sentiment (perfect for the Friendship theme!) from the Coffee Set by Waltzingmouse directly onto the panel using True Black Ink from PTI. I added 3 sequins to give it texture and a little shimmer! Doesn't the stenciling look 3D - like it's cut out of the panel rather than just inked?? I love this technique!! So how does Friendship inspire you? 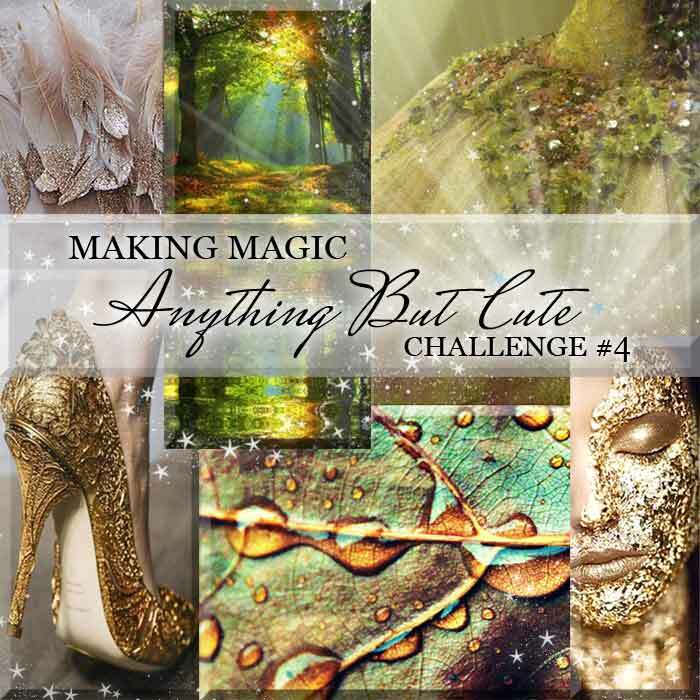 Can't wait to see your Mixed Media Cards linked up over at the Mixed Media Card Challenge - you'll find all the deets and lots of inspiration from the rest of the talented design team here! Mixed media being defined as texture, dimension and techniques. Accessories: Coffee Cup Stencil - ARTplorations, sequins, water mister - Ranger. 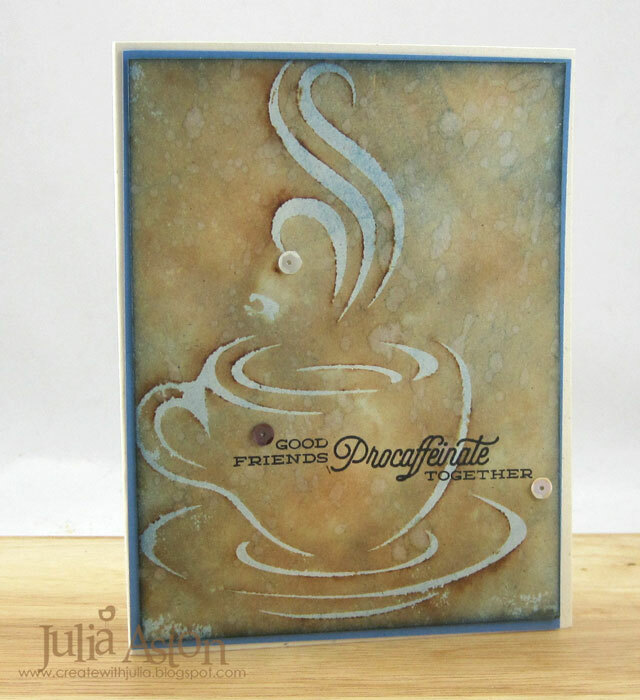 What a fabulous stencil print - the colours are perfect, like milky coffee - just love it! Gorgeous card Julia! Love the beautiful background! This is just so cool! The way you did the background reminds me of a great travertine tile! Super great design! Fantastic card and wonderful technique! And the 3-D effect is wonderful! Gorgeous card! Your card really does remind me of my friends because we always go for coffee. Love the color!!! This is a very smart looking card. 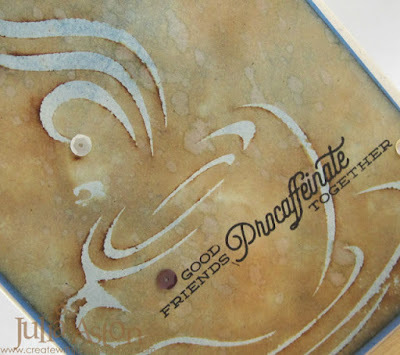 Love the fun sentiment and the stencil technique looks fabulous. 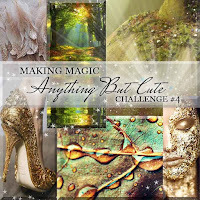 Thanks for joining us at Anything But Cute. Absolutely amazing design...love it, Julia!